Believe it or not, this is a gate at Boston Logan Airport. 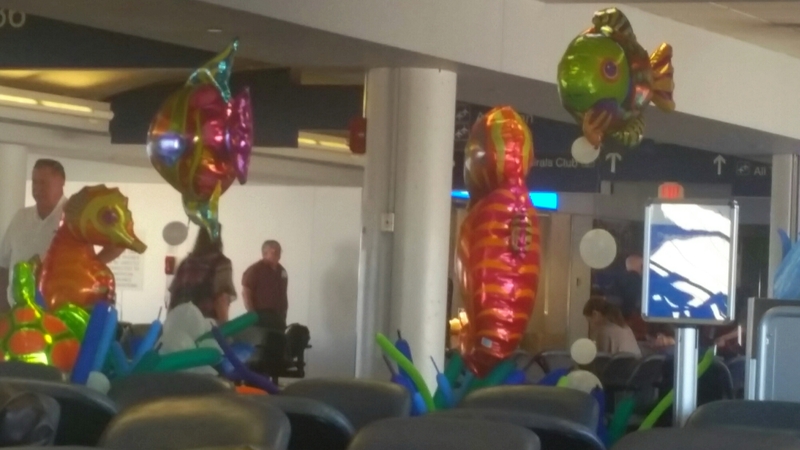 Apparently a lot of cruises depart from this gate, and the airlines decided to have some fun with the decor. How human of them. How thoughtful. How fun for the kids who are accompanying their parents on the trip. I think other airports and other airlines should follow suit. More than one person has stopped to look and take a picture. It has put a smile on their faces too. And smiles can be hard to come by during a long day of travel. This entry was posted in Airplanes, Children, decor, Humor, Life, Travel and tagged airlines, airport, balloon, Boston, children, cruise, decor, decorations, gate, Humor, Logan Airport, parents, Travel. Bookmark the permalink.